That's from Dr. Suess's The Sneetches. "Now, the Star-Belly Sneetches had bellies with stars. The Plain-Belly Sneetches had none upon thars." In case you don't know the story, a few Sneetches had stars, making them special, and the rest of the Sneetches coveted them. Along came a machine that slapped stars on bellies and soon all the Sneetches were sporting stars. Not so special anymore. In fact, not having a star became the next rage, sending all the Sneetches to queue in front of the star-removal machine. Once no one had stars, they soon became the rage again. The poor Sneetches went crazy getting stars removed and attached in their desperation to be unique. Although I'm not desperate to be unique, I do agree with the Sneetches that it's nice to be singled out, especially if, unlike the Sneetches, you've actually done something to earn it. I'm here to tell you a received a star recently. A couple of them, in fact. And although I am not a Sneetch, I do feel a bit special. As an author, receiving praise and a modicum of acclaim is such a crap shoot but also, I admit, a great deal of fun. Will you forgive me for telling you about my stars? ALL THE BEST PEOPLE was reviewed by the Historical Novel Society and chosen as an editor's pick! These folks are serious historians so it's like getting an A on the history part of my novel. They praised the characters, too, and lots of other things. Yay! If you'd like to read the full review, it's here. That review made my week and I'd have been happy to leave it at that, but then I was struck by lightning! Not really, although this was possibly less likely. Travel and Leisure magazine did a round-up of the best book in every state. Not the best book written this year in every state, but the BEST BOOK EVER. Picks included previously unknown titles such as Steinbeck's THE GRAPES OF WRATH (Oklahoma), King's THE SHINING (Colorado), Smith's A TREE GROWS IN BROOKLYN (New York), Twain's HUCK FINN (Missouri), and Hawthorne's THE SCARLET LETTER. These books are so famous I feel silly including the author and the state. 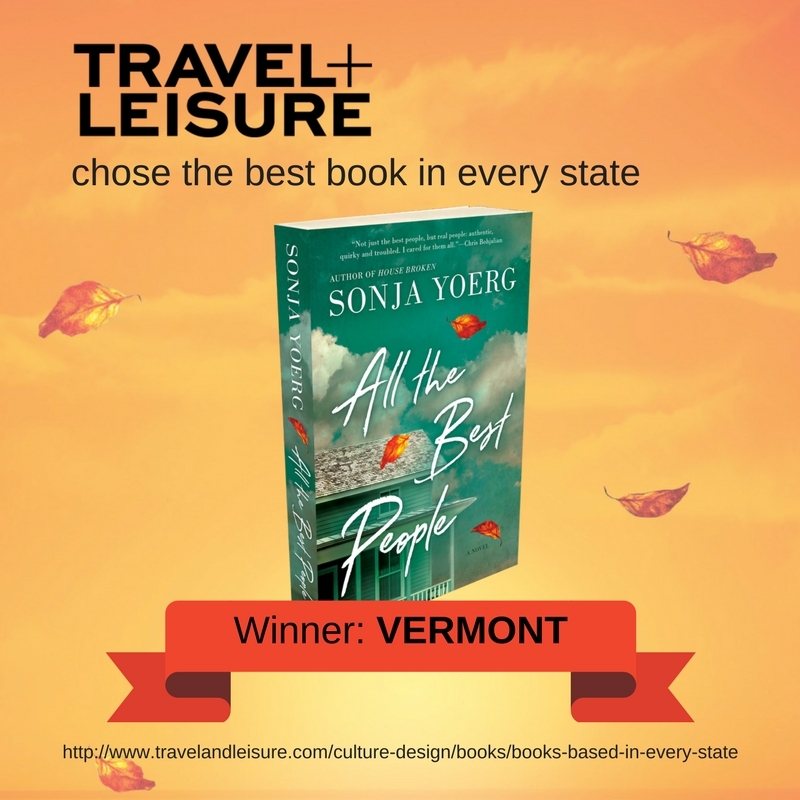 Now you can readily see why I'm incredulous that Travel and Leisure chose my book for my home state of Vermont! The full list is here. Amazing, isn't it? Those are my stars. For a little while, I'm going to be wearing them both on my belly. I hope you have done something to be proud of recently, regardless of whether you get the recognition you deserve. And if you do get a star, I hope you wear it proudly! Life can be tough, and far from fair, so let's celebrate when we get lucky, as I have. Cheers!